Thanks so much for sending the photos! I really appreciate that. Such a personal touch! Shopping for the Man in your Life? Husbands, boyfriends, Fathers, Dad as well as some fab gift ideas for valentines gifts for men. We make it easy to shop online for men's gifts - and we offer FREE delivery same day in Auckland! Don't forget we stock 30th birthday balloons, 40th birthday balloons, 50th birthday balloons. A Balloon box is a fun gift for a guy and (snigger!) bound to be just a little embarrassing when delivered to work, as happily pops up out the box to surprise him. We also have other great present ideas, for mens birthdays, or as an anniversary gift for him, including gift boxes, plants, masculine floral bouquets. It's true to say that Gift baskets are our most popular gift for men for Birthdays, anniversaries, and for Dad on Fathers Day. 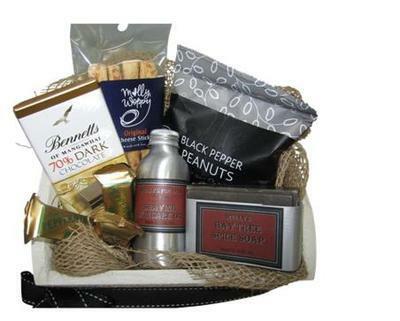 We can deliver a "Man Box", cappucino coffee gift baskets, gourmet baskets, fruit baskets, healthy treats hampers, or a sweet tooth hamper. Perfect gift ideas for him. Many men like to receive flowers and plants as presents - particularly at Valentines Day. Check out our stunning, natural textures bouquet, which is perfect for sending to a man. For flowers for men, we tend to design something simple and masculine, using bold flowers, and of course easy to look after! Please call on 09 838 9058 if you would like to speak to our florists and discuss other options for delivery to your man.